Join Us for Music in the Park Every Thursday in September! Make plans to come and stay in Mexico Beach as the fun and sun continues this fall! Music in the Park kicks off September 5 from 6–8 p.m. CST and will continue each Thursday in September. These events, held at Sunset Park beside the El Governor Motel, are free and open to the public. The concerts offer visitors and residents an opportunity to kick up their feet and enjoy musical talents while taking in the glorious views of Mexico Beach. With local favorites and national musicians lined up to perform, this year’s concerts are sure to be some of the best yet! “Music in the Park is a family event that allows parents to enjoy listening to great music while the kids can either dance around in the grass or go play on the beach,” said Kimberly Shoaf, President of the Mexico Beach Community Development Council. “This year we are fortunate to have Jerry Salley, a singer-songwriter and a 2004 Grammy winner, kick off the weekly event.” Bo Spring, a Port St. Joe, Fla., native who is known for his folk and acoustic rock performances, will be opening Music in the Park with Salley. September 12 will feature Heat and the Zydeco Gents. This group brings Louisiana flare to the beach as they put their spin on zydeco and folk music. Visitors and locals are encouraged to come jam out with Rockin’ Randall and the Gang on September 19, and Charlie and Dana Black will play September 26. “Both [Charlie and Dana] have written for country music legends, and Charlie has been inducted into the Nashville Songwriters Association International Hall of Fame,” Shoaf said. Charlie Black has written 15 number one hits including “Shadows in the Moonlight” recorded by Anne Murray and “Right on the Money” by Alan Jackson. Dana Hunt Black moved to Nashville in 1993, where she wrote her first hit, “Check Yes or No,” recorded by George Strait. Today, the couple resides in Port St. Joe. 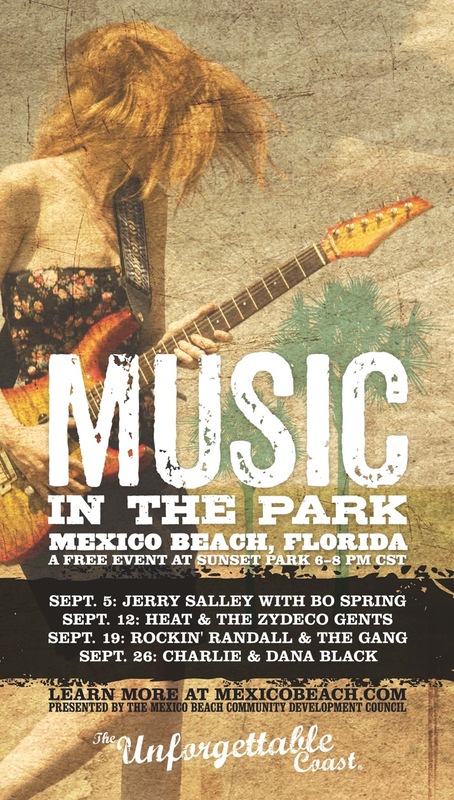 From country to rock in roll—with some bluegrass and zydeco in the mix—Mexico Beach’s Music in the Park is an event you won’t want to miss. Come enjoy a new lineup every Thursday in September and make memories to take home from The Unforgettable Coast!